>Rubik’s cube. 1 minute 14 seconds. hawt. Author Adam PaulPosted on January 14, 2007 Categories generalLeave a comment on >great success. >a little background: if you haven’t seen/discovered/been told about the g.i. joe videos online then you should check them out. it will help you appreciate the the song/video i’m about to share with you. here is a link to an entire list of these types of videos…but if you’ve seen these please read on. actually, read on regardless, but if you don’t quite get the video, well, thats why. anyways. my buddy, paul, and i got together and decided to remix the over dubbings and turn them into some sick beats. hopefully we’ll do a handful of them, but the first one we did was the don’t talk to stray dogs one. go here to watch it. props to ben hollon for putting the video together. but anyways, that view has obviously changed in the last few weeks. so much, in fact, that i am prepared to do another lil review. i’m not going into detail about each track, but i think i’ll rank the songs in order of my likeness (either first to last or last to first – i haven’t decided how i’ll do it yet – probably last to first, more dramatic and i think it more successfully highlights songs individual songs). but i will refer to it as the “Top 10” because just because song number ten is song number ten doesnt make it the worst on the cd. it just makes it the 10th best. thats how i roll at least – optimism and positive vibes. ready break. granted this “top 10” might shift and adjust as i continue to live off this album, these are the current AP Rankings, though the Coaches’ Poll might read differently (i’m so clever). ps: i’d also like to take this post to recommend The Beatles saucy remix cd “Love” it is the other musical masterpiece i’ve been thriving on as of late. apparently the dude that used to mix all the Beatles old stuff decided to break out all the master tapes and throw together some genius. i was skeptical when i first heard about it (“how many albums can they put out after they’re done?”) but this one is great and worth a listen. or even a lot of listens. so so great. >so i got my wisdom teeth pulled on friday morning, and so far i’ve had no problems whatsoever. no swelling, very minimal pain, and i quit bleeding after a couple hours. i am, however, unbelievably paranoid that something will start hurting/go wrong. it is four days after surgery and my stitches have already dissolved/fallen out and i just have big holes in the back of my mouth now. everything is probably all kosher and good, but it is just such a strange feeling that i can’t help but wonder if everything is going according to plan. but i imagine that if something was wrong then i’d truly know it. so i’m safe to assume, for now, that there is nothing wrong. i’m wary of these things called dry sockets (or for you dental freaks, alveolar osteitis). apparently they are an common post-surgery issue with wisdom teeth extraction. wikipedia says it “occurs when the blood clot at the site of a tooth extraction is disrupted prematurely.” i’m not sure what that looks like in my mouth though. i’ve just got a big hole back there and thats it, but wikipedia also says that it is “often extremely unpleasant for the patient, as symptoms include extreme pain (sometimes worse than the toothache that indicated the extraction), a foul taste, bad breath, and swelling in the infected area. There may be lymph-node involvement.” i have no pain. my mouth tastes of its usual lovliness, and i assure you, my lymph-nodes are in no way involved. and i’m not even on pain meds. i don’t need those. please. i’m a man. thanks guys, being stoned is of equal importance as lymph-nodes for me. Author Adam PaulPosted on January 9, 2007 Categories general3 Comments on >alveolar osteitis. upon my first listen, i wasn’t terribly impressed. i think i came into it expecting “The Black Album” and that isn’t exactly what i got. “TBA” is clearly one of the best rap albums put out in recent years, and, lets be honest, is hard to top. 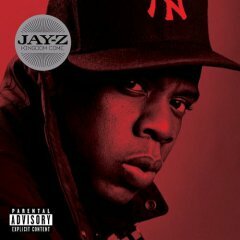 Jay-Z doesn’t top it in this album, however, this turned out to be exceptional. its not wrong. just different. 1. The Prelude – this first track was shocking. strings and horns and not a lot of groove…on the first track! not gonna lie Jay, but this was a weak album opening. maybe he wanted to start it off on a slow note and work into track 2, but by the 1:15 mark i’m ready to move on to track 2, and about 95% of the time i don’t even listen to The Prelude anymore. i mean, its not a bad track, but it isn’t what i expect and love out of S. Carter. 2. Oh My God – this is more like the Jay i expect. lots of noise and lots of movement out of yours truly. i thought i was going to bust a hole in the dashboard the first time i heard this track. the cymbals go off and it pretty much forces me to do the same. Good Lord. some of the lyrics are weak, i think at least. He actually throws down some Kanye West rhyme early in the track. “if this is your first time hearing this, you’re ’bout to experience some(one) so cold” is the first phrase of the song “We Don’t Care” off “College Dropout”. fun fact for the moment. i like this song, for sure, one of my favorites on the album. 3. Kingdom Come – Jay throws down some serious Hammertime on this song. the keyboard during the verses is straight out of MC Hammer’s “Can’t Touch This”, it’s just spiced up a bit. okay, actually a lot. I’m a fan of this song too. Again, not the same as “TBA”, it’s a different Jay-Z but i do like it. i think he just puts down more beats and puts less emphasis on the lyrics. The chorus in this song leaves a bit to be desired as fas as i’m concerned, but the keyboard chords during the verses more than makes up for it – plus at 1:39ish he actually says “can’t touch this”. big fan. i did an audio doubletake the first time i heard it – i knew i could place the beat, but i couldn’t figure it out until then, but once i heard it i immediately rewound it 30 seconds and did it again. 5. Lost One (feat. Chrisette Michele) – there are a couple songs on this album that are surprisingly low key and are flirting with rhythm and blues. the next two tracks are both examples of this. i especially like the end of the first verse – Shawn starts talking about how “fame is the worst drug known to man”. it is encouraging to hear things like that from a wealthy entrepreneur like Jay-Z. if i were Jay-Z i’d be so full of myself, thats for sure. This song is a winner though. 6. Do You Wanna Ride (feat. John Legend) – John Legend can give any song some serious soul, and this song is no exception. This is a song, much like track 5, that rides the rap/r&b fence for sure. Man. John Legend is just so great. thats all i have to say about this song. just sit back and enjoy the ride cause it is smooooth. 7. 30 Something – this song makes me laugh. Jay-Z is trying to convince everyone that he’s still awesome even though he’s in his 30’s. I find this funny for a number of reasons: first, what is it with rappers and having to explain themselves? eminem is the worst about it. i think he’s great, but half his songs are all about the fact that he’s controversial and why. i dont get it, but Jay-Z decided to do that here. I’m thirty and a millionaire and grown up and mature, basically. he goes on and on about how he used to be versus how he is now. he’s still Shawn. he’s got “good credit and such.” oh, and secondly, i just think its funny that Jay-Z has to let people know he’s awesome. i mean c’mon. Jay-Z will be awesome til he dies, he doesn’t need to prove himself. 8. I Made It – just in case we weren’t aware, Jay-Z made it big. his mom should be proud of him because he’s from Brooklyn and he made something great of himself. it’s a decent song, but it’s got the same message as a bunch of his songs: even a poor kid from NYC can make it big – a good message, but seriously Jay, get some more material. that harsh, but i kinda feel that way. a typical number 8 track – weak and unconnected to the beginning or the end. the mid/late tracks fall off sharply. 9. Anything (feat. Usher & Pharrell) – this is just too much usher and pharrell – this is not the Shawn Carter of old. this song is more like “Usher and Pharrell featuring Jay-Z. Again though, these aren’t necessarily bad tracks, just not what i expected. 10. Hollywood (feat. Beyonce Knowles) – i must admit, i really like this song. probably because i honestly like Beyonce’s sound, but i really like the beat too. There’s this part at the beginning when Beyonce sings something and then Jay-Z repeats it in his own tighter-sounding words: “come to my place (come to the crib) and we’ll discuss it (lets chop it up)”. haha. lovin it. the chorus makes me feel like i just hopped out of a limo onto the red carpet. lights. camera. hollywood. i’m a fan of this track. 11. Trouble – what a club beat this little diddy is. grind on folks. 12. Dig a Hole (feat. Sterling Simms) – go ‘head, bury yourself. this song and the one preceding it land in the roll-up-in-an-escalade-with-spinners category. 13. Minority Report (feat. Ne-Yo) – this song is devastating. it’s about Hurricane Katrina’s effect on the slums in the Gulf Area. it is a cry out from Jay-Z regarding how poorly the situation was handled in New Orleans, it is critical of the government and leaves off with Kanye West’s rather controversial comment to the press saying that “George Bush doesn’t care about black people.” hopefully and most likely that is not the case, however, the argument is sung beautifully and forcefully: it seems like no one even cares about the many people (predominantly black) in our very own country left homeless in the aftermath of Katrina. many audio clips of the refugees are used and it really hurts to hear. our government ought to be able to help save those in need in the South. this song tugs at my heartstrings terribly and it is one of the best songs on the album and possibly my favorite. 14. Beach Chair (feat. Chris Martin) – the album closes with this harpsichord track. it’s a slow song about life and how S.C. lives his. “life is but a beach chair.” from what i’ve gathered, Jay-Z is playing off the “life’s a beach” phrase and turning it around to a positive and optimistic view. life is but a relaxing day in the sun. fulfill your dreams and do what you want. life isn’t a beach – its a beach chair. its a nice closing song, i think. kinda eerie in parts even, i like it. PS. i realize my track summaries got worse and worse as the album progressed, that is largely due to the fact that i dont really have any motivation to do things i dont really care about. i tried on the tracks i like and i didn’t try on the rest. so phooey. >it is amazing how quickly life can go from being really fun to really busy in a matter of moments. just an hour ago i was playing Lion King on SEGA with my buddy Dan. Then here i am finding out that i have to pay rent and tuition, pack my stuff, finalize my schedule, get a new job, buy books and go back to Manhattan. talk about a buzzkill. just as my “break” begins to slow down and i get a chance to relax for a day it picks back up almost immediately into a hurricane of errands/payments. there is just so much stress that comes with a new semester. way too much work. seriously. life should not need to be so busy. but one thing that always seems to bring a bit of relief is school supply shopping. today i went to Office Max and picked up five graph spiral notebooks, two folders and some batteries and as i left the register i felt a slight sense of calmness. school supplies just have this crisp organized feeling about them that makes me feel so prepared. i leave that store ready to destroy any course that steps in my way. i’m organized and motivated and B’s are not an option. but i know the moment i get to class the first day i’m going to open up my graph spirals and write “Linguistic Anthropology” or “Religion in American History” at the top and i’ll want it to look so perfect so that it would match the crispness of the unused spirals. but thats just not possible. so i’ll probably erase it and write it again, trying to land the perfect lettering, but in the process i’ll smudge up the first try and it’ll just make it worse and by the end of my first class period i will quickly remember what a poor student i truly am. awesome. but for now, i’ll savor the organization and go to bed because i have a lot of junk to accomplish in the morning. stupid school, always raining on my parade. i’m not really sure what i think about this guy. 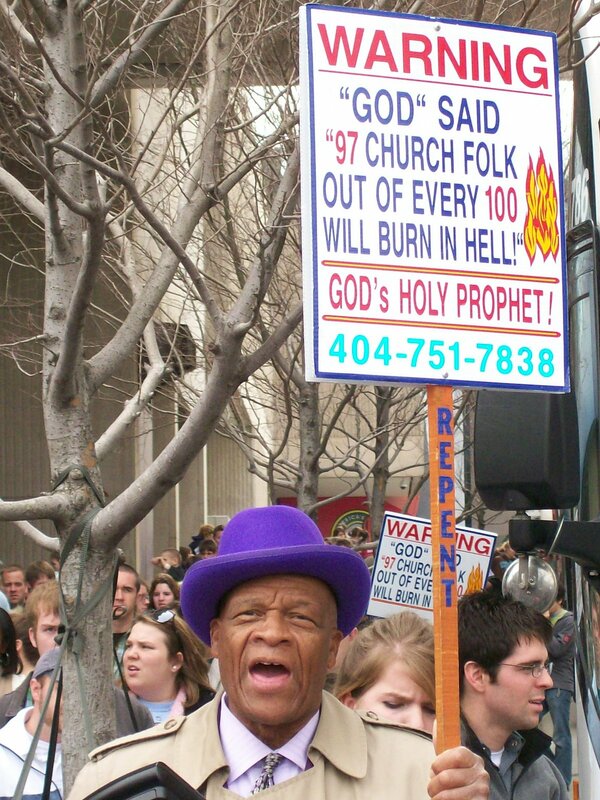 he was just standing outside outside a Hooters in downtown ATL belting “REPENT. REPENT. REPENT.” i snapped this quality picture of him and thought i’d share. apparently he had a vision about this? hm. maybe i’ll call him and find out. Author Adam PaulPosted on January 7, 2007 May 16, 2011 Categories generalLeave a comment on >pimp or porphet?